Visually, I’ve always loved the rich, dark colors that are predominant in steampunk: copper, bronze, rich woods. And the idea of taking items apart and reassembling in a pleasing way is a key element of how I work, so although I’ve done that for a long time, when steampunk and I discovered each other, I was already repurposing items. Beyond artwork, I love the whole idea that this history is both imaginary and visionary, and we get to write our own past and future. 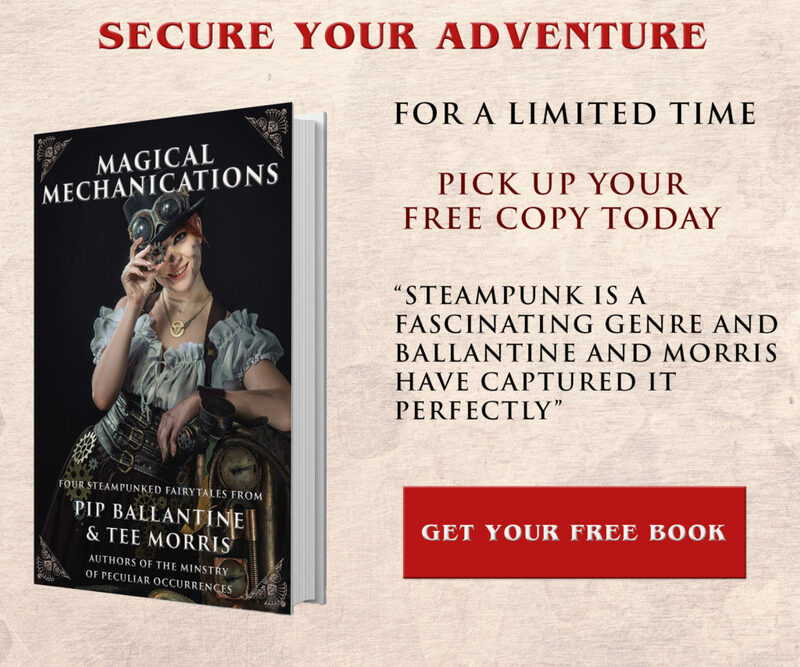 For me, the world of steampunk is limitless, and a starting place for wild adventures. I have always worked in small scale, from dollhouse furniture to miniature sculpture. 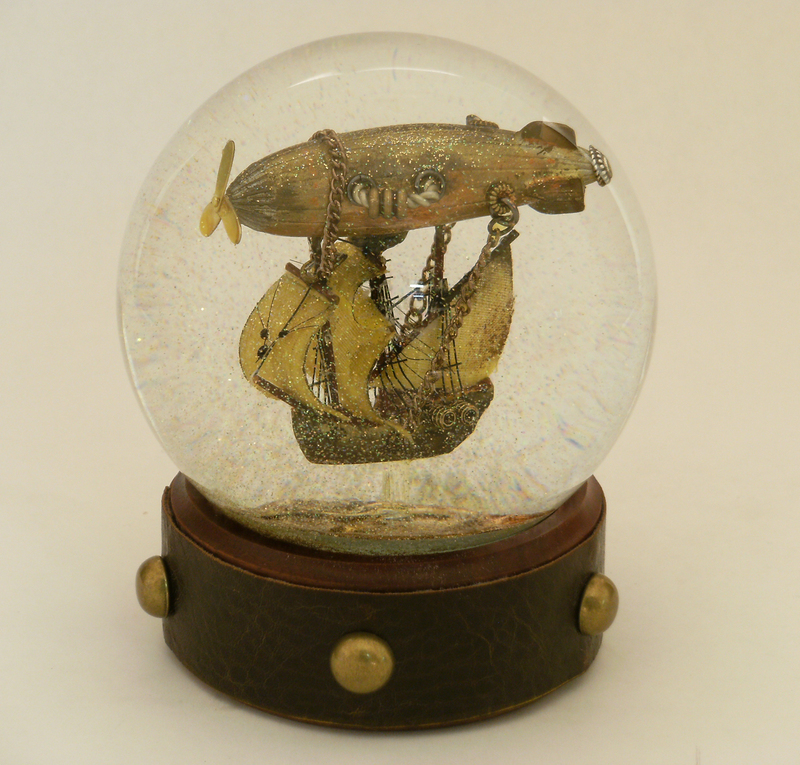 I wanted to dive into making snow globes simply because I could not find the kind of waterglobes I wanted for myself. I kept searching at art shows and there was nothing, so I found a collaborator who could help with the technical aspects and started there. 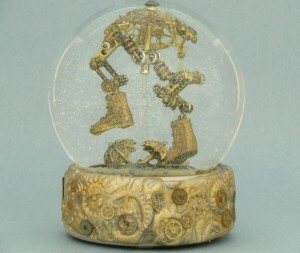 A snow globe sculpture must be a certain size to fit inside the glass globe, so the imposed limit thrills me. I am constantly pushing to see what I can achieve in a small space. 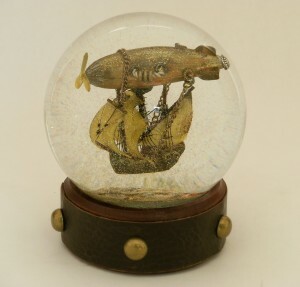 Many people say, “Oh, I LOVE snow globes” and there just aren’t that many that are designed for anyone older than eleven. I love the surprise when people see these industrial and fantasy designs for the first time and do a double take. They get even happier when I encourage touching and shaking — the contradiction in the world of art etiquette. PLEASE pick this up and shake it. Makes curators crazy. My inspirations can come from anywhere – I keep a notebook next to my bed, as there are nights when I wake up and have a clear idea of something I want to make. I scribble something down and try to make sense of it in the morning. Because of the small scale, anything that Is tiny will catch my imagination, from toys to jewelry pieces, and I’m always thinking “what could I do with that?” I pick up pieces of metal from the street and can wander in a hardware store looking at shapes that might evolve into something else. As far as the technical process, so much is trial and error, putting things together and making them proportional and pleasing. I will start and abandon a piece repeatedly until I like how it looks. I have to make the sculpture as close to perfection as I can, because when they are under liquid and glass, the flaws magnify. I’ve taught myself skills in jewelry making, soldering, wire and clay. It’s always a mixed-media evolution. 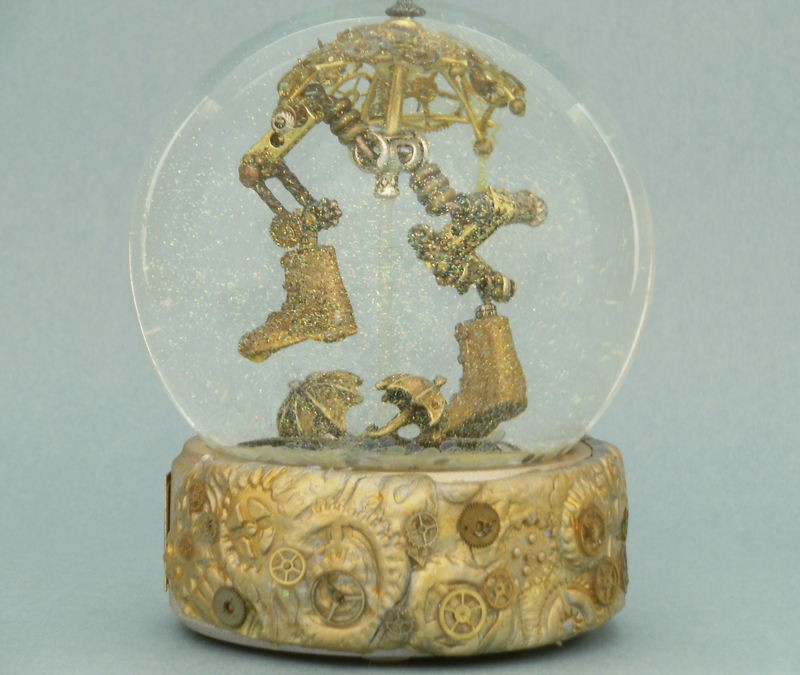 When a sculpture is complete, I turn it over to my snow globe engineer who seals it so it will not deteriorate. I am grateful to his technical expertise, because I get to concentrate on the fun stuff and he makes sure it will not fall apart. 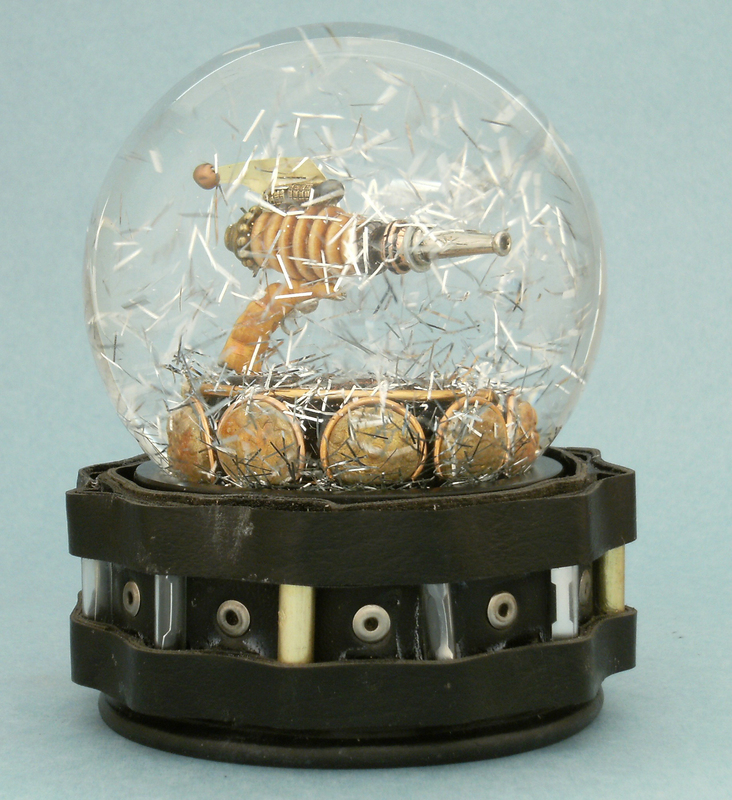 I have been making art all my life, but I do recall my first attempt at making a snow globe. I now call it “Ashes to Ashes, Rust to Rust” and I still have it. I thought that I could put watch gears in the liquid in lieu of confetti and these perfect little shapes would rain down when the globe was shaken. I had not considered what happens to metal in liquid. Rust. Never crossed my mind. This piece is now a glass ball with orangey-red bits in the liquid and the rusty silhouettes of watch gears that disintegrated but left a shadow on the glass. So the piece is a reminder that art is not exempt from chemical interaction. I would like to take this idea to another level someday and create pieces that intentionally rust, but I’m not there yet. I’ve had pieces given to loved ones on their wedding days, and for important anniversaries, gifts given to people who are in the hospital for the last time, and memorials – so the stories behind how someone feels strongly about a piece of art are meaningful to me. But there is one single piece that I have kept on my desk, and that is “Rain Gear.” There is something about seeing nothing but a pair of robot legs and an umbrella communicating pure emotion that intrigues me. I never get tired of looking at it. I thought it was fitting since she is always surrounded by a crowd of artists, but I never found out if she loved it or was perplexed by my gesture. 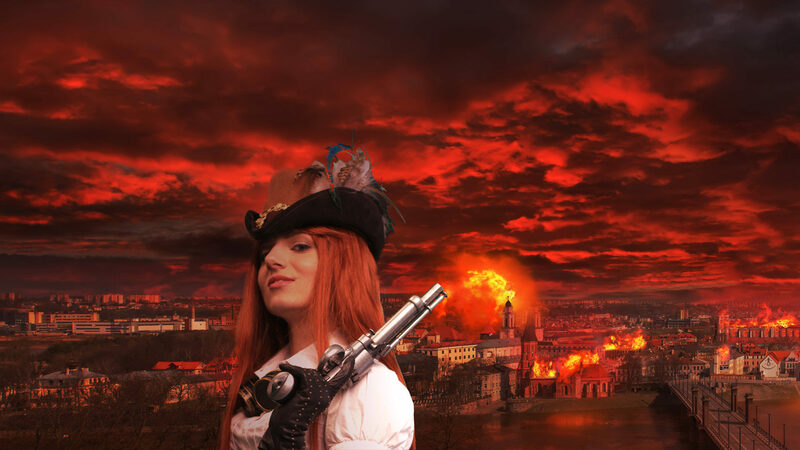 This is where I should mention that not all my artwork is “steampunk” – even by my own free and loose definition. I get obsessed with other ideas, such as M.C. Escher, or re-creating Leonardo DaVinci inventions in snow globes. I’ll design little scenes where Star Wars characters meet D&D figures. Or where an octopus plays the cello. Once in a blue moon, I get a wild impulse to make something pastel and sparkly with little elves and snow covered cottages, or rainbow unicorns walking on moss-covered bridges — I don’t always edit my impulses until they play out. 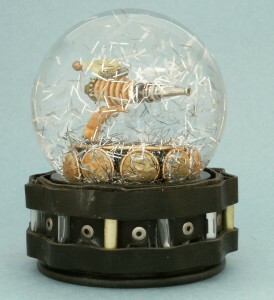 If I like it, it’s a snow globe. If I hate it, it goes into a crate of things I can cannibalize later. I have lots of strange things waiting in that box of weirdness. 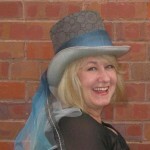 Camryn Forest was born in Chicago, Illinois, but has lived in Denver, Colorado for more than three decades. She have a degree in journalism and makes her primary living as a writer of ordinary things, such as press releases and annual reports, but also studied fine arts at the University of Colorado at Boulder. She spends most of her evenings, weekends and vacations viewing and making art, which is a pleasing balance. Herfamily includes a wonderful husband, two amazing kids, and they once owned the most amazing dog in the world, whose memory still brings us joy. He is irreplaceable, but she might get another goldfish someday. No promises. Her website is www.camrynforrest.com where most of the pieces she has made are shown, and there’s a story about how each one was designed or inspired. She also has an etsy store. ← Previous Previous post: YOU can join the Ministry!